Academia and industry working together toward a common goal: to make the world a better place. Most of us would agree this is a worthy aspiration. But if the consensus is that we need to tear down the silos, roll-up our sleeves, and work together, why is it that collaboration is more often the exception than the rule? In their now seminal piece in Harvard Business Review in 2005, Bennis and O'Toole https://hbr.org/2005/05/how-business-schools-lost-their-way seemed to touch a real nerve in their assertion that business schools had lost their way, and lacked the 'courage' of other professional schools - in medicine and law, for example - to define the standards that would benefit their professional students. The article’s effect seemed seismic. In truth, the article didn’t seem to change anything at first. In the last dozen years, however, the business school industry has seen gradual, but nevertheless major changes. Enhancements to accreditation processes and government demands such as impact case studies in the UK's Research Excellence Framework (REF) have all made business schools more relevant. But - and this a big but -without changing some of the major drivers in play that disincentivise academics from building greater ‘real world impact’ from their research and teaching. As a leading publisher of business and management research, Emerald took it very seriously, and reflected on what it might mean for business schools, many of whom were our customers. How should we evolve to meet the new demands that might come our way? Frustration at a lack of movement and aware of the role played by publishers in this stasis, Emerald commissioned some original research in 2017 from Research Consulting, which was published in November in a white paper titled 'The business of impact: does anyone use management research?' http://www.emeraldgrouppublishing.com/promo/thoughtleadership/pdf/rwi_whitepaper.pdf. Emerald did this to firstly prove that the relevance gap was there, and secondly to get some insight as to what can and should be done to ensure that research has impact in the real world. That there is a gap is quite clear - for example, a whopping 97% of academics feel their research has some sort of relevance outside academia, but only a third feel incentivised enough to actually engage with practitioners. What came through loud and clear is that while there is ample opportunity on both sides to engage and collaborate, the ‘structural disincentives’ in place and traditional academic cultures actively prevent this happening. These findings have become the basis for what we call the Real World Impact campaign. 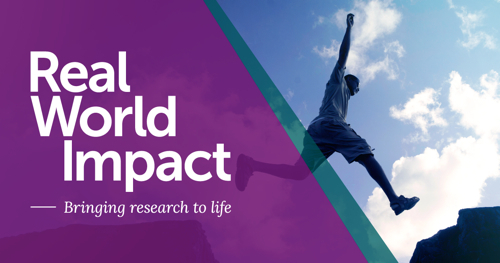 With the Real World Impact blog as a platform, we are calling on funders, business schools, and research communities to tackle the ‘structural disincentives’ that continue to hamper efforts to create bridges between academia and society. Our whitepaper offers some potential solutions. For instance, business schools cementing their role as ‘anchor institutions’ that support businesses, help academics establish relationships with professionals, and create opportunities for collaborations. Or universities reviewing academic career progression in a way that rewards research that results in demonstrable change. We don’t have all the answers, and this is a debate that needs refreshing. If you’d like to share your thoughts on how academia and practice have or could work better together to tackle real world issues, please let us know at RealWorldImpact@emeraldgroup.com.